I’m well aware everyone loves a bargain especially with tradies giving cash discounts. We all understand household budgets are being stretched to the limit by ever increasing state government charges on electricity, car registration and water charges. 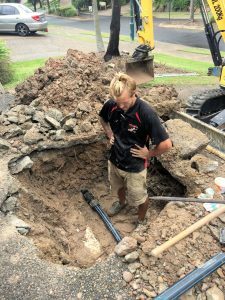 In the 41 years I’ve been in business nothing has changed in one area, and that is so many people expect substantial cash discounts if they pay tradies in cash. The trade services sector of the economy is notorious for undercutting and giving cash discounts to clients who pay in cash. Generally, tradies who offer substantial cash discounts are solo operators who are pocketing the cash and not paying for critical business expenses to protect clients such as public liability insurance. As a rule, they are also tax cheats which cost us all more in tax ultimately. Cash discounts rip everyone off including yourself when you have no invoice to prove who did the work which means no guarantees if anything goes wrong. I have lost count of the number of times I have been out to defective and non-compliant plumbing jobs where the client cannot get hold of the original plumber who did the work. Frequently this is because they have no record of who did the work as they paid in cash for the work to be done cheaply. This results in the client paying twice to have the same job undertaken and often costs much more to rectify and make legally compliant. The ATO and the Tax Commissioner, Chris Jordon are 100% correct in saying cash discounts were ripping “billions of dollars” out of the economy that would otherwise be going to services such as schools and hospitals. Like most other business owners I am 100% supportive of Chris Jordon when he recently issued a passionate plea to Australians to stop paying tradies in cash as the ATO confronts a host of black-economy rorts that include the fraudulent misuse of ABN’s. The Australian Government’s Black Economy Taskforce has estimated that the cash economy is now in excess of $25 billion a year. Simply this is $25 billion of cash transactions where no tax is paid in GST or PAYG or superannuation or company tax. 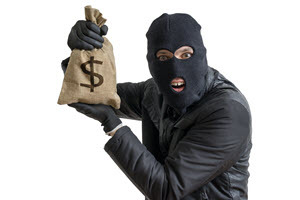 I’m well aware some people like to pay in cash but don’t rip yourself off by not getting an invoice from the tradie who has done your work if you pay him in cash. As a precaution, you should always ensure that you are getting a legitimate ‘Tax Invoice’ that has all the tradies details on it including a legitimate ABN and their QBCC contractors licence number. It’s very simple to check an ABN to ensure it’s not a fictitious ABN. All you need to do is go the ABN Lookup and type in the ABN. 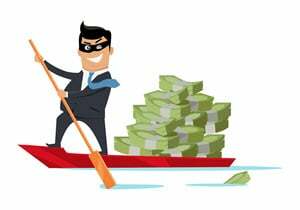 It is quick and easy to do but gives you the assurance that you are dealing with a legitimate business that is paying their fair share of tax. Every tradie must have a QBCC contractors licence and once again its very easy to check at the QBCC Online Licence Search. Remember if they don’t have a licence then you do not have to pay them. Scarily the Black Economy Taskforce found 40 percent of ABN’s quoted where cash is paid to tradies, were the Bunnings ABN. There is no suggestion Bunnings has done anything wrong. The old cliche that you get what you pay for will always be true. There is no need to ever pay cash despite what some tradies will try and force you to do. You should never let a tradie take you to an ATM where they sit with you watching you take out cash. In today’s world of instant payments and it pays to protect yourself and create a digital trail. At Whywait Plumbing we will happily take payment in cash or cheque or credit card. But we will not give you a discount for paying in cash ever as every job is invoiced correctly and paid into our bank account. Remember at Whywait guaranteed upfront pricing ensures you always know the cost of your job before we start the job. 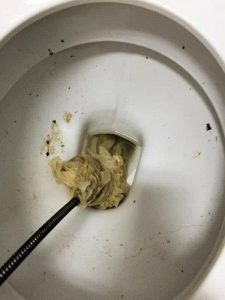 Flushable wipes are an environmental nightmare which is what I termed them in September 2015 when we here at Whywait Plumbing were seeing a horrendous increase in blocked drains. At the same time, consumer advocacy group CHOICE published the results of their dirty testing of “flushable” wipes and cleaning cloths in their testing labs. CHOICE came to the same conclusions that plumbers had long learnt and that was that “flushable” wipes were in most cases NOT FLUSHABLE. 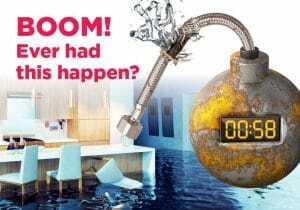 Last year we promoted to Whywait Plumbing clients to join the CHOICE campaign to get rid of “flushable” claims on products that aren’t safe to flush. The worst offender in everyone’s eyes was the Kleenex brand. In fact, the website for Kleenex Cottonelle Flushable Cleansing Cloths For Kids claimed that the cloths break up in the sewerage system like toilet paper. As a result of this claim, CHOICE put it to the test and found that while toilet paper dissolves in a few minutes but the Kleenex wipes held together for over 21 hours. 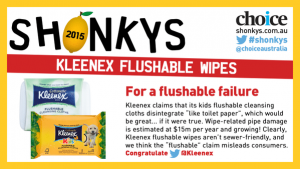 Kleenex has responded to the CHOICE campaign by releasing an allegedly new and improved “flushable” wipes product. As a result, CHOICE has tested this new product and found nothing has changed. 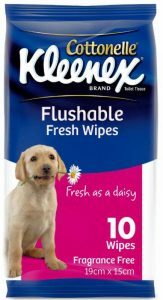 Kleenex new flushable wipes will still block your drains because they do not disintegrate like toilet paper. When the CHOICE lab tests were widely published in all media last year, and the false Kleenex claims were exposed it sent a strong message to Kleenex. In fact, the message was so strong they apparently felt they needed to reinvent their “flushable” wipes. But as CHOICE testing has found the “NEW” wipes are nowhere good enough to be considered safe to flush down your toilet. They are NOT FLUSHABLE, and they certainly do not disintegrate like toilet paper. As CHOICE states companies such as Kleenex need to deliver on their promises and should be prohibited from selling products that mislead consumers. 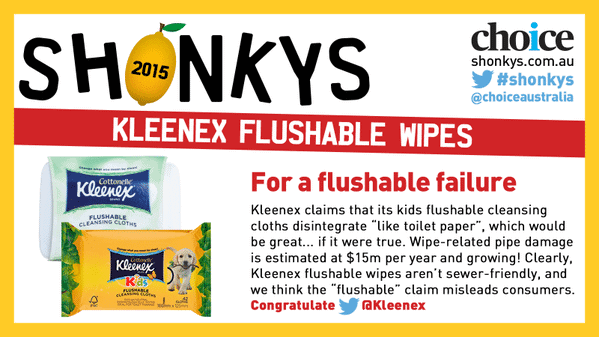 These Not-so-flushable Kleenex wipes put your homes sewer drains at risk of blockage still. As a community, we can and need to get these falsely marketed products off the supermarket shelves. That is why I urge you to tell your friends and family about the dangers of these dodgy Kleenex products to help keep your house drains, and the City of Gold Coast sewer drains flowing. Like every other Gold Coast plumber, we here at Whywait Plumbing are seeing a horrendous increase in blocked drains due to the skyrocketing popularity of so-called “flushable” wipes. The term “flushable” is a catchy phrase and a favourite sales pitch presenting an image of convenience and hygiene. But the reality of what happens to flushable wipes once they are flushed down a toilet pan is that they do not dissolve like toilet paper. In fact, they remain intact, and these pieces of non-woven fabric when regularly used are blocking toilets, blocking house drains and blocking the City of Gold Coast sewer system. It is gratifying to see local media taking the lead and highlighting the absolute disaster that flushable wipes are to our local Gold Coast environment. In a recent interview with Robyn Wuth that I did for the story “Gold Coast Sewerage Treatment Plant Wiped Out Once A Week” which was published in the weekly Gold Coast Sun and online at the Gold Coast Bulletin I was accurately quoted as saying wipes are an “environmental nightmare”. 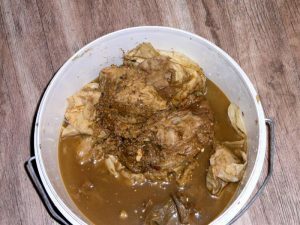 Frustratingly for many businesses such as restaurants the increase in customers using their toilets and flushing wipes down the toilet has seen an increase in the number of blocked drains they are experiencing. For many businesses, the repeated flushing of wipes has resulted in costly and inconvenient consequences. The photo on the left clearly illustrates the problem where the toilets were all blocked at a Gold Coast McDonalds restaurant. Retrieving them in this instant was critical as they had created an interwoven tail of toilet paper held together with flushable wipes from the blocked toilet all the way into the sewer drains. Wet wipes or disposable wet wipes are a new phenonium having only gained popularity in the last ten years. The early versions of these wipes were slow to gain widespread acceptance until manufacturers re-introduced them for a broader range of applications other than being just baby wipes. Now they are available for multiple cleaning and hygiene tasks in the home and in workplaces with them being packaged in convenient carry cases that fit into handbags, glove boxes etc. and as a result, their popularity has skyrocketed. Frustratingly for ourselves and many Gold Coast plumbers, the durability of new generation wipes has seen blockages increase as the disposable wet wipes now come with confusing names. As you can in the photo on the right, they collect together in a drain very quickly and are a nightmare for us to remove in commercial high rise buildings. Sadly flushable is assumed to mean biodegradable to consumers who love their convenience. As a result, when wipes are flushed down the toilet, there is a misleading assumption that the wipe will be the same as toilet paper and dissolve. For many of our clients flushable means just that, until the problems begin from repeated flushing of wipes. If they are lucky they only experience a toilet blockage but often it is a complete blocked drain that would never have occurred but for those appallingly named flushable wipes which are in reality non-flushable. Trust me the only things that are flushable in your toilet are toilet paper, urine and faeces. If you wish to continue flushing wet wipes or flushable wipes in all their forms down your toilet, then I recommend you become a Whywait Plumbing Service Partner.